I have been saving these pink plastic grocery bags for a special project. 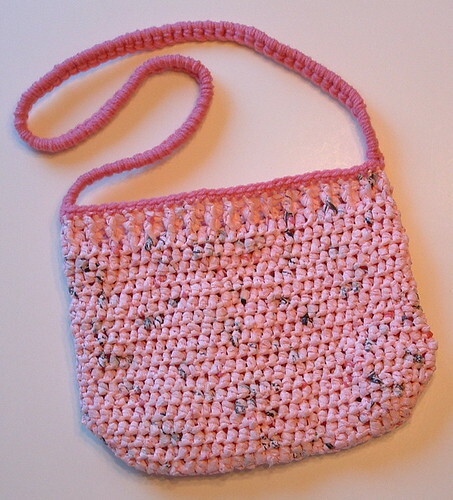 I finally decided to crochet a pink purse and donate it to this year’s Relay for Life fundraiser. In case you are wondering about these beautiful pink bags, they are special and very hard to find. A dear on-line friend sent them to me and I am so happy to be able to recycle them into a cool new purse. Here is a closeup of the cable stitching at the top and the strap. Just click to super-size. 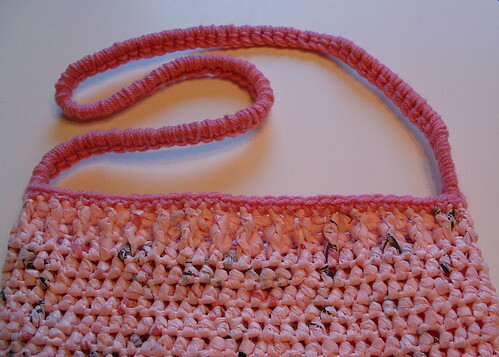 I have named this purse Pink Passion Plarn Purse and lined it as shown. Please enjoy the free crochet pattern below. My Useful Ideas is a blog where ideas will be shared that are designed to save you money, help you solve a problem, answer a question, fix a problem, explain how to deal with a situation, and generally help you out. I am not an expert but will share with you ideas and solutions that I have found work and that are helpful in everyday use. Some of the ideas are very basic and which you may have read about in the past but I write to share my experiences and hopefully help out someone who may have not had to face the same challenge yet in their life. Here is a small baby doll bunting I crocheted. It fits a doll that is 6 to 7 inches tall. This is a variation of a 12-inch doll bunting pattern that I crocheted last year. So whether you have a small doll like this one shown or a larger baby doll, you can use my free patterns to crochet your doll a cute baby bunting. Enjoy and happy crocheting! 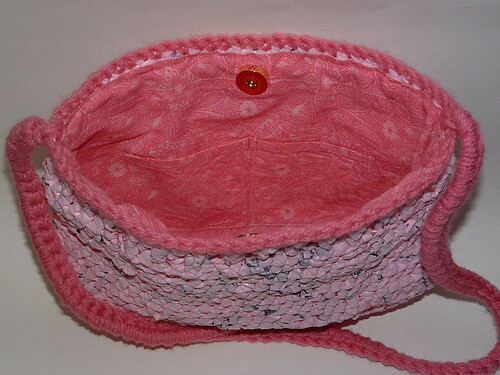 I’m happy to present my crocheted laundry basket. This laundry basket project is made from recycled plastic bags or plarn. In case you are new to the idea of crafting with plastic bags, here is my picture tutorial showing how to make the plastic yarn from the plastic retail bags. This laundry basket project has been a huge undertaking. 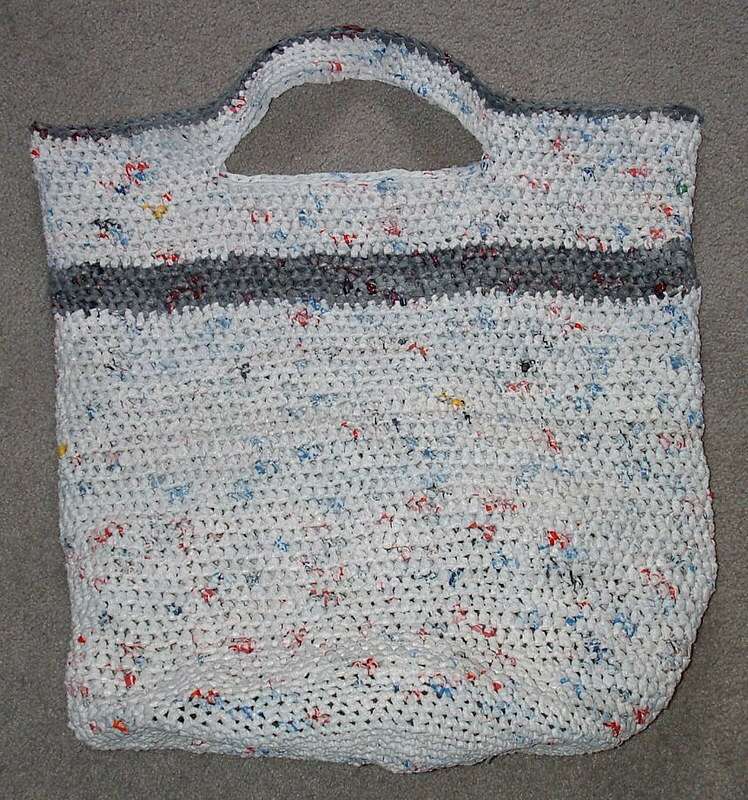 It is the largest recycled plastic bag project that I have ever crocheted. It has well over 150 bags in the finished product. 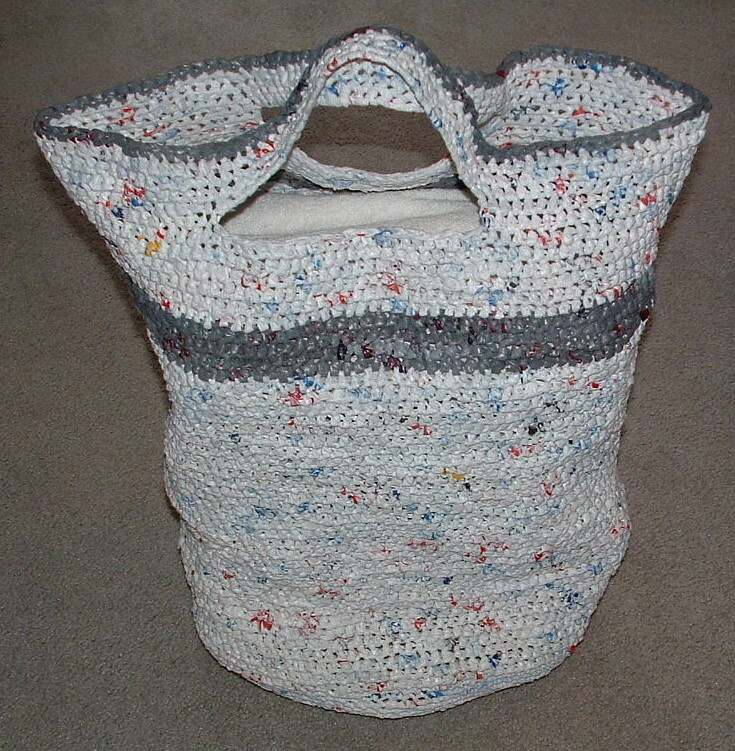 When I set out to crochet a laundry basket, I wanted a large enough bag that I could use for a clothes hamper as well as a carrying bag for transporting the laundry to and from a laundromat. The basket has a round base and while it looks funneled-shaped at the top, its really round in it’s overall shape. The photo above has 6 large beach towels in the bag and as you can see it still has room for more. You can also roll down the top and handles when using it for a hamper so it stands up if the basket isn’t full.